Vedas Facts, History and Quotes - What are the Vedas? The Vedas are the sacred books of Hinduism. In the orthodox view of Hinduism, the Vedas and the Upanishads are the foremost in authority, importance and antiquity. 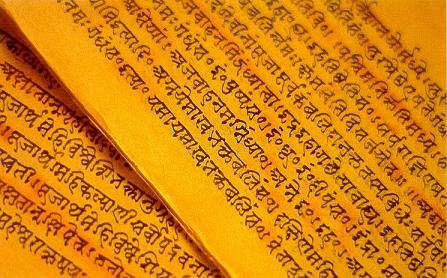 The Vedas (Sanskrit: "knowledge"), the most sacred books of Hinduism and the oldest literature of India, represent the religious thought and activity of the Indo European speaking peoples who entered South Asia in the 2d millennium BC, although they probably also reflect the influence of the indigenous people of the area. The Vedic texts presumably date from between 1500 and 500 BC. This literature was preserved for centuries by an oral tradition in which particular families were entrusted with portions of the text for preservation. As a result, some parts of the texts are known by the names of the families they were assigned to. In its narrowest sense, the term Veda applies to four collections of hymns (samhita): Rig Veda, Sama Veda, Yajur Veda, and Atharva Veda. These hymns and verses, addressed to various so called deities, were chanted during sacrificial rituals. In a wider sense, Veda refers to both these hymns and the materials that accreted around them to form four books with four parts. For each of the Rig, Sama, Yajur, and Atharva, there are not only hymns, but also Brahmanas - prose texts that explain and illustrate the significance of the ritual; Aranyakas, or forest - treatises - esoteric texts providing symbolic or magical interpretations of ritual formulae; and the commentaries called Upanishads - the beginnings of Hindu philosophy. Vedic rituals essentially involved offerings to and with fire under precisely prescribed conditions by which the sacrificer hoped to communicate with the deities and thus to obtain desired results. The importance attached to the satisfaction of formal conditions required that a priest with knowledge of the proper forms officiate at the sacrifice. Many of the deities addressed by the sacrifice were identified or associated with natural objects of forces such as fire, water, and wind. Among the most important were Indra (thunder, war, and perhaps creator), Varuna (guardian of the cosmic order and moral law), Agni (fire, light), and Soma (a liquid used in the sacrifice). The form and functions of one god, however, were not strictly distinguished from those of others and, as the Vedic period progressed, thought developed from polytheism to monotheism and thence, in the Upanishads, to monism. The relation of Vedism to the Hinduism of later centuries is complex and not well understood. The Vedas are preserved in traditional fashion in certain parts of India, and the tendency is widespread to look to them as expressions of the fundamental genius of Hindu thought and aspiration. The originals of the major Hindu gods - Shiva and Vishnu - can be found among the minor deities of the Vedas. The sacrifice has, however, all but disappeared from India in its Vedic form, replaced by different rites; and the analogy, central to the Vedic ritual, between actions on Earth and events in the heavens is replaced in Hinduism by the goal of liberation from actions on Earth, from life itself. The concepts of Karma and Transmigration of Souls are not found in the Vedic corpus until the Upanishads. Hinduism in India traces its source to the Vedas, ancient hymns composed and recited in Punjab as early as 1500 B.C. Three main collections of the Vedas--the Rig, Sama, and Yajur--consist of chants that were originally recited by priests while offering plant and animal sacrifices in sacred fires. A fourth collection, the Atharva Veda, contains a number of formulas for requirements as varied as medical cures and love magic. The majority of modern Hindus revere these hymns as sacred sounds passed down to humanity from the greatest antiquity and as the source of Hindu tradition. The vast majority of Vedic hymns are addressed to a pantheon of deities who are attracted, generated, and nourished by the offerings into the sacred flames and the precisely chanted mantras (mystical formulas of invocation) based on the hymns. Each of these deities may appear to be the supreme god in his or her own hymns, but some gods stand out as most significant. Indra, god of the firmament and lord of the weather, is the supreme deity of the Vedas. Indra also is a god of war who, accompanied by a host of storm gods, uses thunderbolts as weapons to slay the serpent demon Vritra (the name means storm cloud), thus releasing the rains for the earth. Agni, the god of fire, accepts the sacrificial offerings and transmits them to all the gods. Varuna passes judgment, lays down the law, and protects the cosmic order. Yama, the god of death, sends earthly dwellers signs of old age, sickness, and approaching mortality as exhortations to lead a moral life. Surya is the sun god, Chandra the moon god, Vayu the wind god, and Usha the dawn goddess. Some of the later hymns of the Rig Veda contain speculations that form the basis for much of Indian religious and philosophical thought. From one perspective, the universe originates through the evolution of an impersonal force manifested as male and female principles. Other hymns describe a personal creator, Prajapati, the Lord of creatures, from whom came the heavens and the earth and all the other gods. One hymn describes the universe as emerging from the sacrifice of a cosmic man (purusha ) who was the source of all things but who was in turn offered into the fire by gods. Within the Vedic accounts of the origin of things, there is a tension between visions of the highest reality as an impersonal force, or as a creator god, or as a group of gods with different jobs to do in the universe. Much of Hinduism tends to accept all these visions simultaneously, claiming that they are all valid as different facets of a single truth, or ranks them as explanations with different levels of sophistication. In sum, Hinduism does not exist as a single belief system with one textual explanation of the origin of the universe or the nature of God, and a wide range of philosophies and practices can trace their beginnings somewhere in the hymns of the Vedas. By the sixth century B.C., the Vedic gods were in decline among the people, and few people care much for Indra, Agni, or Varuna in contemporary India. These gods might appear as background characters in myths and stories about more important deities, such as Shiva or Vishnu; in some Hindu temples, there also are small statues of Vedic deities. Sacrificial fire, which once accompanied major political activities, such as the crowning of kings or the conquest of territory, still forms the heart of household rituals for many Hindus, and some Brahman families pass down the skill of memorizing the hymns and make a living as professional reciters of the Vedas. One of the main legacies of Brahmanical sacrifice, seen even among traditions that later denied its usefulness, was a concentration on precise ritual actions and a belief in sacred sound as a powerful tool for manifesting the sacred in daily life. Polytheism is belief in, or worship of, multiple gods or divinities. The word comes from the Greek words poly and theoi, literally "many gods." Most ancient religions were polytheistic, holding to pantheons of traditional deities, often accumulated over centuries of cultural interchange and experience. Present-day polytheistic religions include Hinduism, Mahayana, Buddhism, Confucianism, Taoism, and Shintoism in the East, and also contemporary African tribal religions. Note that according to some Hindu literature, there are 330 million (including local and regional) deities or gods worshiped in Hinduism. In the ancient world Egyptians, Babylonians, and Assyrians worshiped a plurality of deities, as did the ancient Greeks, Romans, and Norse. However, the best-known example of polytheism in ancient times, is arguably Greek/Roman mythology (Zeus, Apollo, Aphrodite, Poseidon, etc.). It is interesting to note that even in polytheistic religions, one god usually reigns supreme over the other gods, e.g., Zeus in Greek/Roman mythology and Brahman in Hinduism. Some argue that the Bible teaches polytheism in the Old Testament. Admittedly, several passages refer to "gods" in the plural (Exodus 20:3; Deuteronomy 10:17; 13:2; Psalm 82:6; Daniel 2:47). Ancient Israel fully understood that there was only one true God, but they often did not live as if they believed that to be true, continually falling into idolatry and the worship of foreign gods. So what are we to make of these and other passages that speak of multiple gods? It is important to note that the Hebrew word Elohim was used to refer to the one true God and to false gods/idols. It functioned almost identically to the English word "God." Describing something as a "god" does not mean you believe it to be a divine being. The vast majority of Old Testament Scriptures which speak of gods are speaking of false gods, those who claim to be gods but are not. This concept is summarized in 2 Kings 19:18: "They have thrown their gods into the fire and destroyed them, for they were not gods but only wood and stone, fashioned by men's hands." Notice Psalm 82:6, "I said, 'You are "gods" you are all sons of the Most High.' But you will die like mere men; you will fall like every other ruler." Everyone can know with certainty that there is a supreme spiritual being, Who is the One True God and the Creator of the world and all that it contains. Everyone knows that God is not something that they have carved out of wood or jade or stone. They know that God is not the tree that they worship or the river they worship or the rock or the snake or the sacred tree frog or nature spirits. They know that these things aren't the Creator of the universe. Every such person knows that he is worshipping a creature rather than the Creator. The Bible and Christian religion clearly teaches against polytheism. Deuteronomy 6:4 tells us, "Hear, O Israel: The LORD our God, the LORD is one." Psalm 96:5 declares, "For all the gods of the nations are idols, but the LORD made the heavens." James 2:19 says, "You believe that there is one God. Good! Even the demons believe that—and tremble." There is only one God. There are false gods and those who pretend to be gods, but there is only one true God.